Orange Julius is a drink that used to appear in malls everywhere; now they are mostly available at Dairy Queen. I loved drinking this delightful, frothy drink. Dave Oberg graciously submitted this recipe. One thing is for certain you don’t need to look for the Orange Julius recipe anymore. Orange Julius is a drink that used to appear in malls everywhere; now this beverage is mostly available at Dairy Queen. One thing is certain, however – I loved drinking this delightful, frothy drink. Thanks to Dave Oberg for graciously submitting this recipe so you don’t need to go hunting anymore for how to make this old favorite. I will show you how to make an Orange Julius at home. This is a drink that used to appear in malls everywhere; now this beverage is mostly available at Dairy Queen. One thing is certain, however – I loved drinking this delightful, frothy drink. Thanks to Dave Oberg for graciously submitting this recipe so you don’t need to go hunting anymore for how to make an Orange Julius. Orange Julius is a chain of juice stands that grew out of one orange juice stand opened in Los Angeles in 1926 by Julius Freed. Initial sales were very modest, but in 1929, Freed’s real estate broker came up with a drink mix that made the acidic orange juice easier on his stomach. Freed’s stand took up this new drink, which had a frothy, creamy texture, and sales took off. It became so popular that people began lining up at the store and shouting, “Give me an Orange, Julius!” This acclaim led to the new drink being named the Orange Julius. In 1987, the Orange Julius chain was incorporated into Dairy Queen where you now are most likely to be able to drink an Orange Julius. So now you have to get you a Dairy Queen Orange Julius when you want to have one. The original stand also provided Bible tracts and medicinal tonics. It became the official drink of the 1964 New York World’s Fair. During 1970 and the early 1980s,it used the image of a devil with a pitchfork inserted through an orange, along with the apt slogan, “A Devilish Good Drink.” This logo and slogan were later dropped because the logo was somewhat similar to that of Arizona State University’s mascot, Sparky. 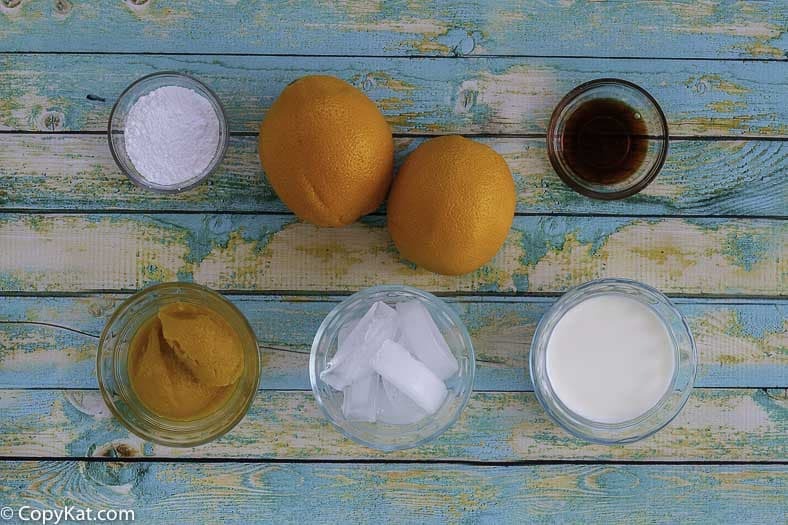 This frothy treat is a mixture of orange juice, milk, powdered egg whites, sweetener, vanilla flavoring, and ice. It’s a wonderfully frothy delicious drink that you will love. At home, orange juice was never like this. The Orange Julius was special, and I loved getting one of these. 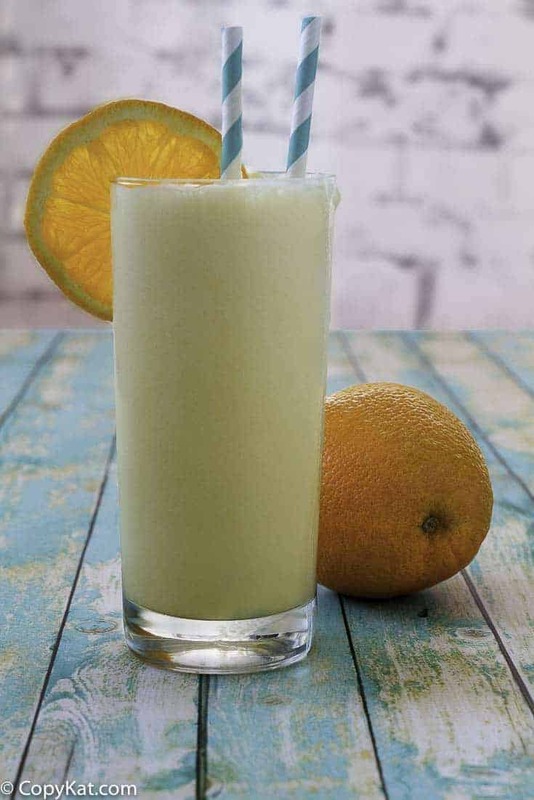 Now you can treat your family to an Orange Julius by making this easy to prepare at home. So now, you don’t even have to make a trip to the mall or a Dairy Queen to get one. Back in the day, I think the original orange beverage was made with raw eggs, but I believe they’ve gotten away from this as many people feel uncomfortable with eating raw eggs. However, if you want to add raw eggs, you can get eggs that are pasteurized, and these are safe to consume. My recipe does not contain eggs. Although this is the perfect refreshing drink to make any time, it’s especially good in the heat of summer. It’s a fun, non-alcoholic beverage that your whole family will enjoy. And, an Orange Julius tastes even better if you use freshly-squeezed orange juice instead of concentrate. To make things easy, you can watch a video to see how to make this special drink. Put all ingredients in a blender, cover and blend until smooth. Hints: If you already have premixed orange juice, use 1 2/3 cups of that instead of the concentrate and water. If your ice cubes are from a tray, you may want to pre-crush them a bit because the ice blends better if it is not in large pieces. The original story about Julius Freed spells out perfectly what was in the original drink. It had powdered egg whites, which would explain the frothy foam that is part of the taste in an orange Julius. I do believe it also said it had milk. It’s a Wikipedia article about the man and his strange concoction. I got very excited when I saw the dream whip comment…that is exactly what I remembered from making these in home economics 35 years ago. I haven’t been able to find my old recipe. Should be able to duplicate it now. Thanks! Many Many Thank you’s for this one. Love an Orange Julius. I will try it with and without raw eggs just to see if it makes enough difference to repeat with the eggs. I was thinking of trying this but with powdered egg whites, but I’m not the best at adjusting recipes. Any idea how many T to start the experimentation with? Thanks in advance! I think it would take far less. I would start with something like 1/4 of a teaspoon to make this. Wasn’t feeling well when I stumbled upon this recipe. Just what the Dr ordered. Thanks! I agree on the rudeness; thank you Stephanie! I saw the comment about “forgetting the egg whites” as well. I got the actual recipe from a friend who worked there in the mall and there were no egg whites in it, however, they only use real frozen fruit from the frozen isle. I like to make them with strawberries or pineapple and they also use granulated sugar rather than the powdered. (This was years ago though so things may have changed) The rest is bang on. xD We love the work you do. I hope you have a lovely Christmas! OOOH…the strawberries and the pineapple both sound so yummy! Has anyone tried making this with malted milk powder? What I remember seems to have had a mild nuttiness in the flavor that balanced the fresh of the oranges. Plus I believe the malt powder (or whatever they used) – after raw eggs were removed – helped with the frothiness. While working on rehabbing an injury I searched for a few ways to make protein powder (Whey ) taste paletable. One of the best was a drink that tastes more like my beloved Orange Julius than any home recipe I have found. I use a milkshake machine but a blender works just fine. Smooth frothy and soo tasty.